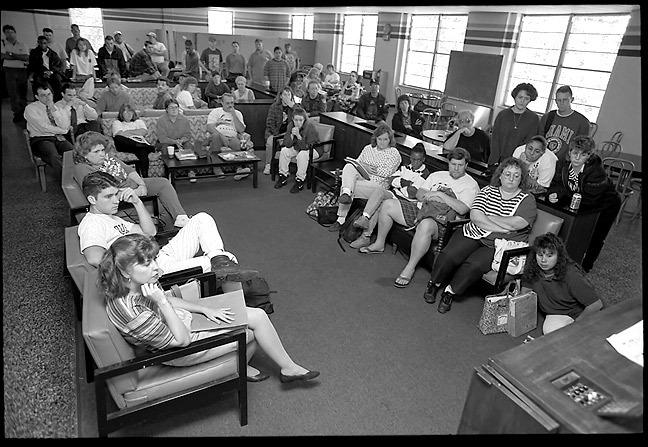 Students gather in the East Central University Student Union on the morning of October 3, 1995, to hear the verdict in the O. J. Simpson murder trial. Twenty years ago, O. J. Simpson was on trial for the murder of his ex wife and her boyfriend. The crime and subsequent trial divided America almost exactly in half by race. Watch this video (link) to see how clearly this issue was divided along racial lines. The trouble with this reaction is that O. J. Simpson was very clearly, obviously guilty of the murders, and the black community was reveling in the fact that he got away with it. Why is it okay for a racial group to almost universally revel in an obvious injustice? Is justice “an eye for an eye?” The message on October 3, 1995 was pretty clear: while it’s not okay for a white person to kill a black person, it is gloriously justified when a black person kills a white person. Revenge is right. Revenge is good. Last year a police officer killed a suspect in Ferguson, Missouri. I very seriously doubt the shooting was racially motivated. The officer, Darren Wilson, had no record of racially motivated behavior, and a grand jury … a grand jury … declined to indict him. Thankfully we have a shallow, self-serving media who was eager to repeatedly say a white police officer shot a black teenager. The truth is, I probably would have shot Michael Brown: the grand jury backs me up. I don’t say this because I lust for killing a black-skinned teenager. I say this because cops face intense stress and intense pressure, and face real threats to themselves and civilians they are sworn to protect every day, threats a typical civilian can’t even imagine. If I was a cop and a big, young, apparently aggressive person of any color posed the same threat Darren Wilson faced, I probably would have shot him. Last month, a Muskogee, Oklahoma police officer shot a suspect who was reportedly at a wedding to murder someone, who ran from the officer, and who turned and brandished a pistol. I probably would have shot him, too: If you look at the body cam video, you will see the police officer shooting a suspect who is turning to run away. Yet, this is probably going to be ruled a justifiable use of deadly force. In the video, you will see the suspect running away, dropping a firearm, then turning to pick it up. At this point, the officer decides to shoot, and once that decision is made, there’s really no stopping it, regardless of what the suspect does next. It works the same way a batter decides to swing at a pitch; the event happens so fast, the batter has to decide to swing or not during the first third of the ball’s flight to the plate. That’s why pitches with movement, curves, sliders and knuckleballs, are so effective. Watch how fast that all happens, and tell me you would be able to make as measured a choice as you did sitting at your computer typing in the comments field of the video. Is it really necessary to say the cop was white and the suspect was black? Read the comments on the video and you’ll find out how important it is for millions of people to hate something, anything, and to respond with verbal advocation of violence. The paradigm seems to be a desire to behave like wild, vicious animals combined by some trigger, often isolated and somewhat insignificant, labeled as justification. While I am on the subject of outright bigotry, why do gays like to say homosexuals are “born gay”? It implies that they know how every gay person was born, raised and lived. It implies that their arguments for gay rights are everyone’s arguments. If you were born gay, fine. If you choose to be gay, fine. Just stop telling me that “all gays” are anything. That’s bigotry. By the way, opponents of gay marriage, you are replaying almost word-for-word the arguments against equal rights for blacks in the 1960s. It makes you look backwards now, and 30 years from now you will look as much like inbred hillbillies as the Alabama whites in 1962 do today. Abby shoots her .380 down at the pond yesterday. We both legally carry firearms, and neither of us care if you are black or white, young or old: if you threaten our lives, we will defend ourselves. In an ideal world, it would not be necessary. What *should* happen is every human should be treated justly and equally: “equal protection under the law”. Each crime and every defense would be judged by its merits, regardless of the appearance of the persons (suspect and cop) involved. Race is not a real thing; it’s a mental construct. But we do not live in an ideal world. Not yet. Is it possible? I hope so. I have a weak confidence that bigotry can be stamped out. There isn’t room here for a dissertation on my part, but it’s clear that the justice system (including policing) is not colorblind in our country. For the same crimes, blacks get longer sentences. On the same evidence, blacks are more likely to be convicted. I thought it was all a myth until I rode with cops and worked with them for several years. A white teen with sagging pants and backward cap: “idiot wannabe”. A black teen with sagging pants and backward cap: “thug” and “he’s up to something”. In the same circumstances and with nothing else to differentiate them. It’s certainly stupid to overgeneralize. I think it only becomes bigotry only when it becomes intolerant behavior (by definition). That’s the inherent fallacy of anyone who Monday-morning quarterbacks these shootings. “Well, what I would have done is…” is just silly — unless you’ve been in that situation. I hope I’m never in that position. If I am, I hope I make the decision based on something other than an in-built racial bias. On the other hand, no statistics are kept, so it’s very difficult to use reason to contradict the strong impression that white suspects get extra chances before getting shot while black suspects don’t get the benefit of the doubt. In the interest of accurate reporting, Nicole Brown Simpson was murdered along with her platonic friend. He was not her boyfriend. I actually disagree with why OJ got off, fame was a HUGE factor. Look at how many get a pass for fame and fortune, the kid that killed 4 people because he was rich..ugg. Goodness,we have some many factors for injustice it is sicking. Jamie, I’m sure O. J. was acquitted for a number of reasons, including his fame and the wealth that allowed him to hire a very expensive “dream team” of lawyers, but that’s not the reason for the racial divide. >>It’s certainly stupid to overgeneralize. I think it only becomes bigotry only when it becomes intolerant behavior (by definition).<< You don't think the gay community is intolerant? If they are not, they are ascendant above all other groups. I think it likely that the gay community tolerates their apostates very little. 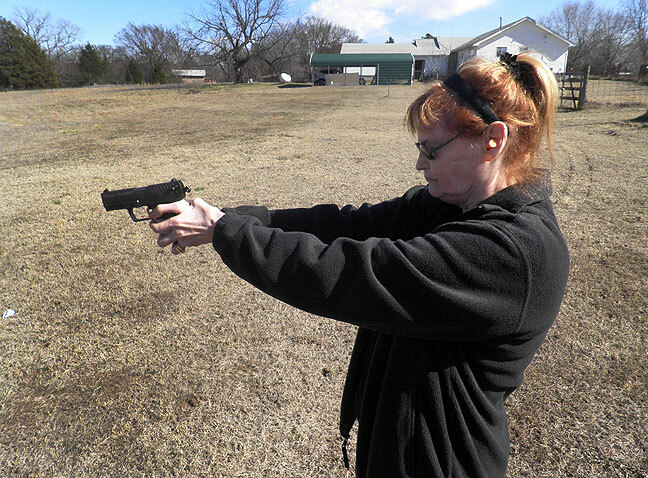 Also, if any gun nuts see the image of Abby and are inclined to criticize her grip, please try to understand that it is the result of her arthritis, and she can't really shoot any other way. I’m not really familiar with “the gay community”. I have known several gay people, each of whom was the *victim* of intolerance. In my anecdotal experience, none of them were “bigots” in any sense I’m familiar with. I disagree with the notion that generalization isn’t bigotry. I think painting a race or creed with a single brush IS bigotry. “All black people are great dancers” is the seed of “all black people are gangsters” because it allows us to dehumanize them and objectify them. Well put. That is indeed the dark underbelly of generalization… “I’m too lazy to see each person for their own worth, so I will categorize them broadly as an arbitrary group.” And then treat them that way. I guess what I was trying to get at, in my own not-very-well-thought-out way, is that action/behavior is different from thought or speech. At least it has usually been so for me. I can admit to having had racist/bigoted thoughts at various points in my life, and I’m sure if stenographic records were available, I’ve probably said some of those thoughts out loud. I’m ashamed of this. But I never once acted on them, never once treated someone differently because of those broad generalizations that were in my head and difficult to purge.